GE’s latest wind technology development is fabric-covered wind turbine blades, which are supposed to even more efficient that the fiberglass that is used now. The swap in technology will allow turbine blades to perform as well, but can be made on-site at a much lower cost, 25-40% less. This drop in manufacturing cost could help make wind energy more competitive as economical as fossil fuels without government subsidies. The fabric is lighter than fiberglass and allows for the production of much longer blades, which can capture more of the wind’s energy. 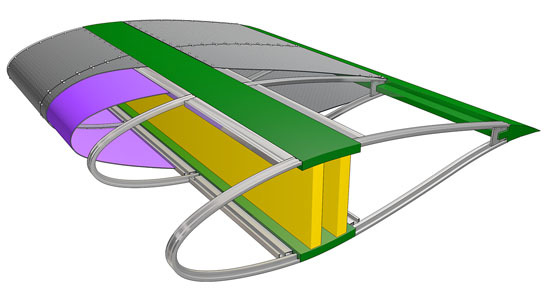 The architectural fabrics will be wrapped around a metal spaceframe, resembling a fishbone. The fabric will be tensioned around the ribs and run the length of the blade. The fabric was specifically designed to meet the demands of wind blade operations. Current blade designs limit the length of the blades, due to financial, assembly and transportation restrictions. Fiberglass molds of blades can cost millions. A lightweight fabric would allow the construction of larger blades that generate wind energy at slower wind speeds. With this new approach to making wind blades, components could be built and assembled on site, meaning design engineers no longer have to concern themselves with manufacturing and transportation limitations. Large blades will help the US achieve the national goal of 20% wind power by expanding wind energy into areas that wouldn’t have been suitable in the past. The $5.6M ARPA-E project will span three years and GE’s blade architecture will be built to achieve a 20 year life with no regular maintenance to tension fabrics required. Be the first to comment on "Fabric-Covered Blades Could Make Wind Turbines Cheaper & More Efficient"